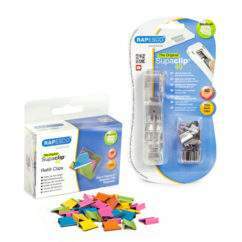 Clips can be removed and reused time and time again without damaging paper. 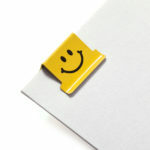 Brilliant for personalising, colour coding and indexing paperwork. 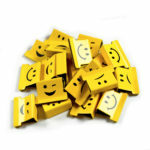 Now available in an exciting new range of colours and designs. Supaclip® 40 Dispenser supplied with 25 Emoji refills. 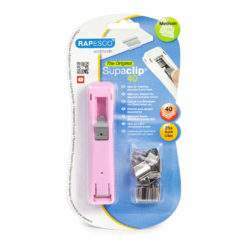 Easy to use, remove and reuse, the Supaclip dispenser easily attaches clips to paper and many other materials , idea for keeping papers neat, sealing packets, fastening for freshness and a host of uses around the office, home and even the garden. The Supaclip 40 Dispenser handles between 2-40 sheets of paper and refills are available in a range of sizes and both stainless steel (making them ideal for external applications as well) and multi-coloured clips , great for colour coding and indexing and a growing range of emoji and heart designs. 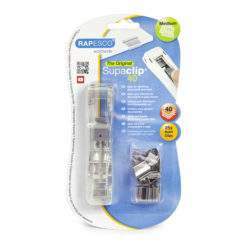 Hugely popular and great for a range of applications , the Rapesco Supaclip is the original and the best. 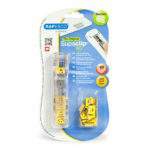 Backed by a 2 year guarantee, the 40 Dispenser has been built to a high standard and will last and last.